Veterans raising as much money as we can to provide assistance to help local Veterans, their families and the community. Food drives & Cash donations to various Groups by the Auxiliary, Legion & SAL. Food drives held during the Easter Egg hunt & other times during the year. Donations for food, toilet items, always welcome contact a Post Officer. Shown 2014 Easter Egg Hunt. Post #71 Each year marches in the Pewaukee Memorial Day and Fourth of July parades. 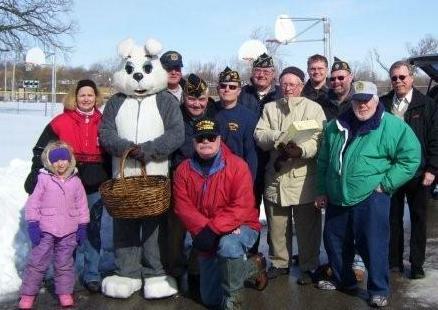 Annual Easter Egg Hunt at Villiage Park in Pewaukee the Saturday before Easter at 10:00 A.M.
Non-perishable food donation is requested when attending. We have been doing the Egg hunt since 1929 along with the Pewaukee Park & Rec. Dept. Pewaukee Schools Distributing Poppies & Veterans Day visits to the classrooms. Post #71 visits to Pewaukee Schools to educate local children on patriotism and Americanism. Provides therapudic recreation of bingo every other month. Our Service Officer is the liason between the V.A. and Post #71 and identifies veteran's needs that the post can assist with. Our Post hosts 6 Bingos per year at the VA . The Poppy Program is the oldest and most widely recognized Auxiliary program. Each year around Memorial Day, Auxiliary volunteers distribute millions of bright red crepe paper poppies in exchange for contributions to assist disabled and hospitalized veterans. The program provides multiple benefits to the veterans and to the community. The hospitalized veterans who make the flowers are able to earn a small wage, which helps to supplement their incomes and makes them feel more self-sufficient. The physical and mental activity provides many therapeutic benefits as well. Donations are used exclusively to assist and support veterans and their families. The poppy also reminds the community of the past sacrifices and continuing needs of our veterans. Auxiliary members endeavor to explain the true meaning of this little flower to all those who receive it. The poppy has become a nationally known and recognized symbol of sacrifice and is worn and used by Auxiliary members to honor the men and women who served and died for their country in all wars. 2 College Scholarships per year to Pewaukee students whose Parents or Grandparents were in the U.S. Military. We sponser along with the Auxiliary students to Badger Boys State & Badger Girls State. Each year as close as possible to September 11, the post lays a wreath in Pewaukee Lake to commemorate the victims of 911. Following the ceremony those in attendance take a nice cruise on Pewaukee lake. Drawing held during the Taste of Pewaukee on Saturday at 10 PM . At Billy Ho's Bar (Legion Post), This is Post #71's largest fund raiser of the year. Tickets are sold usually Saturday's & Sunday's in June & July at Pick N Save, Wal Mart, Beach party & finally at the Taste of Lake Country. Contact us for tickets. 586-216-9761. Each year the post gathers together for a good time watching the Army / Navy game. 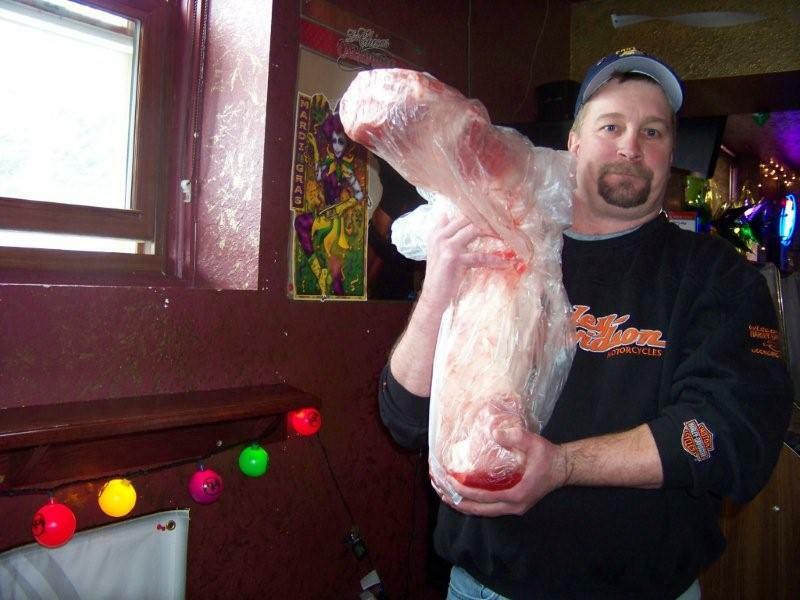 Meat raffles are another way for the post to raise money in order provide assistance to veterans and their families. These start in October & run until March. Check with the Post or our calendar on this web site as time nears. Annual Trip to Diamond Joe's Casino in November..
As a perk of post 71 members and their spouses are eligible for a trip to Des Moines Iowa to visit Diamond Joe's casino. Some of the folks gamble the entire time. Some congregate at local shops, the local museum and other establishments to prepare for the bus ride back to Pewaukee. If you are real lucky you can occupy a seat next to one of the refreshment coolers on the bus. Yes, there is a bathroom. This event is open to a limited number of non-members for a nominal fee. Call 586-216-9761 for information.